Number puzzles (sudoku, kakuro, calcudoku and others) and logic puzzles (picross, for example) is what I’ve been focusing on since 2005. I’ve never created any puzzles with words. Well, that’s about to change! I’m ready to present you with my first ever Word Search puzzle (aka Word Find, Word Sleuth, Word Seek or Mystery Word)! This is my newest addition. I have, as you know, created number search puzzles before and published a book of number searches. I’m sure any puzzle lover has encountered Word Sleuth puzzles before, but just to make things clear: you are provided with a grid of seemingly random letters, with a word list below the grid. Your objective is to find those words in the grid! The words can be laid out in any of the four directions: horizontal, vertical, left diagonal, right diagonal, but they can also be spelled backwards, so there are, effectively, 8 ways a word can be hidden in the grid! Each word appears only once in the grid. And to make things more interesting… when you complete the grid and find all words, some of the letters will not belong to any of the words you found! Those remaining letters form another word, which represents the solution of the puzzle! 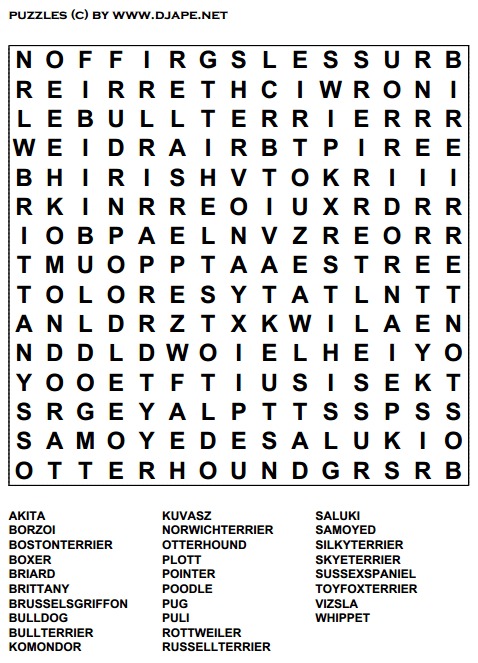 This first word search puzzle I’m posting has the name of all kinds of Dog breeds hidden inside; also, the solution of the puzzle reveals another dog breed! Word Search Puzzles – DIFFICULT! 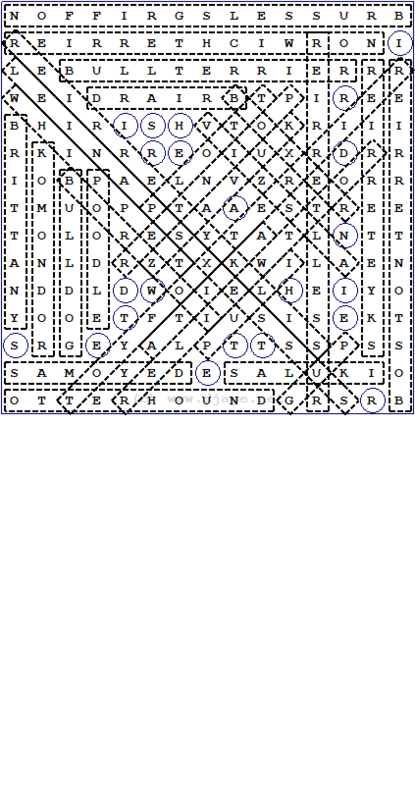 PDF Version of this puzzle: Free Printable Word Search puzzle PDF.. Please let me know what you think of these and how do you like this particular one! Thanks! This entry was posted in CalcuDoku, Free sample puzzles, Kakuro, Picross, Puzzle variants. Bookmark the permalink. Post a comment or leave a trackback: Trackback URL. First, I do love your puzzles – the 15-grid Samurai, in particular (my favorite!). I enjoyed the word search, as most word search books do not offer an unidentified answer to look forward to. I enjoy that. However, if I might make a suggestion: The dog names are so long, it makes them too easy to find – in my opinion. Either a larger puzzle (not necessarily recommended) or words with smaller lengths and many same letters to make them a little harder to find. Thank you so much for all your work. “Word Search” is very boring to me. And it is always print in various difficulties in the “cheapest” magazines —–in Germany!!! One look – and I find the word(s). But don’t know how famous this puzzle is in US?! Much more interest to me –your last and very special new various “wild Samurai’s”. Unfortunatelly no comment at the moment, cause I couldn’t print it out?! Spent nights in hope to repair the printer —and later the software cause all other prints worked well! Easier to copy it by hand directly at least!!! And damned technicial brain at first…same thoughts as your “zero, zero, high”-puzzle before! I also love your puzzles, especially samurai sudoku. The word search is a refreshing change but this one was too easy to be called “difficult”. I enjoy the bonus at the end too since I did these in a newspaper I used to read. Please continue with them.